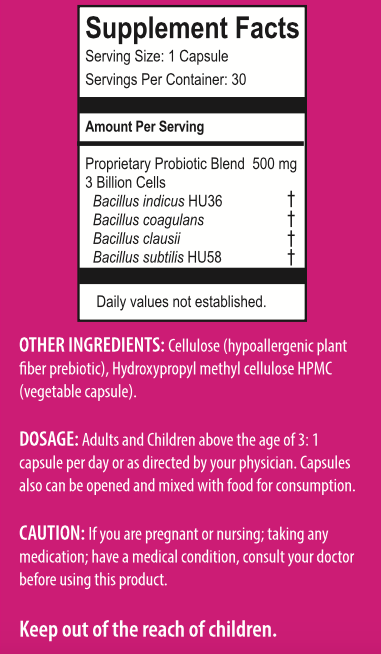 Thousands of commercial products have "probiotic" printed on the label, but even this advertising can be misleading. A probiotic is not truly a probiotic unless the bacteria can make it to the intestine alive. 100 percent survival through the gastric system means 100 percent efficacy as a probiotic. 99.99 percent of the bacteria in most commercial probiotics are killed before they make it to the small intestine. Just Thrive® probiotic bacteria not only reach their destination, alive and thriving, but they then produce powerful antioxidants in the gut using a special probiotic strain. Just Thrive® contains Bacillus indicus HU36 -- a strain able to make protective carotenoids in the small intestine, including CoQ10, alpha and beta carotene, lycopene, lutein, astaxanthin, and zeaxanthin. "At least 11 different carotenoids are found in the walls of HU36 spores," Journal of Applied Microbiology researchers confirm. Without any risk, your body may utilize Bacillus indicus HU36 as "a useful source of dietary carotenoids. "4 Just Thrive® is the world's first combination probiotic/antioxidant that can provide these benefits. Adults and children can take one capsule of Just Thrive® per day, or as directed by a physician. If you're experiencing health issues or are just beginning to recover your gut health, it's best to start slow. Try one Just Thrive® capsule per day and see how your body reacts. You may begin to feel a difference within just two to three days as any underlying gastrointestinal discomfort subsides. Your digestive system may calm, and bowel movements may become more regular. This regulatory effect is especially helpful to young children who struggle with constipation. Most Just Thrive® users report feeling much better in a short amount of time! This may look like improved energy, better sleep, and a renewed sense of well-being. After a round of antibiotics, taking Just Thrive® may be what your body needs to get your gut health back on track. Just Thrive® is a unique antioxidant-producing probiotic that can remain completely stable in the presence of an antibiotic. ** Many commercial probiotics are destroyed by antibiotics, but these "good guys" hold their ground to keep the gut healthy and strong. Feel better, live better. "I have been able to completely stop my [rheumatoid arthritis] medicine, and my hives have stopped. I just feel all together better, I can’t say enough about this product!" - Jen M.
**Please consult your physician for advice regarding any specific medical condition. “Survival of Probiotics in Simulated Gastric Fluid.” Silliker, Inc. Food Science Center Report. RPN 16663. Hong HA, Huang JM, Khaneja R, Hiep LV, Urdaci MC, Cutting SM. The safety of Bacillus subtilis and Bacillus indicus as food probiotics. J Appl Microbiol. 2008 Aug;105(2):510-20. doi: 10.1111/j.1365-2672.2008.03773.x. Epub 2008 Feb 29. PubMed PMID: 18312567. J. L. Barnes, B. Hartmann, J. J. Holst, K. A. Tappenden. Intestinal Adaptation Is Stimulated by Partial Enteral Nutrition Supplemented With the Prebiotic Short-Chain Fructooligosaccharide in a Neonatal Intestinal Failure Piglet Model. Journal of Parenteral and Enteral Nutrition, 2012; 36 (5): 524 DOI: 10.1177/0148607112444131. K. A. Tappenden. Probiotics Are Not a One-Species-Fits-All Proposition. Journal of Parenteral and Enteral Nutrition, 2012; 36 (5): 496 DOI: 10.1177/0148607112458407. Laura Steenbergen, Roberta Sellaro, Saskia van Hemert, Jos A. Bosch, Lorenza S. Colzato. A randomized controlled trial to test the effect of multispecies probiotics on cognitive reactivity to sad mood. Brain, Behavior, and Immunity, 2015; DOI: 10.1016/j.bbi.2015.04.003. Johan Larsbrink, Theresa E. Rogers, Glyn R. Hemsworth, Lauren S. McKee, Alexandra S. Tauzin, Oliver Spadiut, Stefan Klinter, Nicholas A. Pudlo, Karthik Urs, Nicole M. Koropatkin, A. Louise Creagh, Charles A. Haynes, Amelia G. Kelly, Stefan Nilsson Cederholm, Gideon J. Davies, Eric C. Martens, Harry Brumer. A discrete genetic locus confers xyloglucan metabolism in select human gut Bacteroidetes. Nature, 2014; DOI: 10.1038/nature12907. Joe Alcock, Carlo C. Maley, C. Athena Aktipis. Is eating behavior manipulated by the gastrointestinal microbiota? Evolutionary pressures and potential mechanisms. BioEssays, 2014; DOI: 10.1002/bies.201400071. Qing Gu and Ping Li (2016). Biosynthesis of Vitamins by Probiotic Bacteria, Probiotics and Prebiotics in Human Nutrition and Health, Dr. Venketeshwer Rao (Ed. ), InTech, DOI: 10.5772/63117. Buffington et al. Microbial reconstitution reverses maternal diet-induced social and synaptic deficits in offspring. Cell, 2016 DOI: 10.1016/j.cell.2016.06.001. Xuelian Huang, Sara Palmer, Sang-Joon Ahn, Vincent P. Richards, Matthew L. Williams, Marcelle M. Nascimento, Robert A. Burne. Characterization of a highly arginolyticStreptococcusspecies that potently antagonizesStreptococcus mutans. Applied and Environmental Microbiology, 2016; AEM.03887-15 DOI: 10.1128/AEM.03887-15.